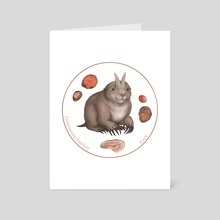 Ceratogaulus hatcheri with agate by Alisa B.
Ceratogaulus hatcheri is a species of the only known rodent genus with horns, which lived about 10.3 to 4.9 million years ago during the late Miocene to early Pliocene! The horns were likely used for defence. 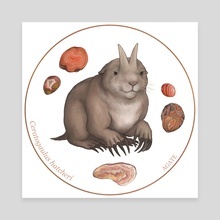 Various kinds of agate are common in Nebraska where most fossils of this horned gopher have been found – one reason why I chose to paint them together.